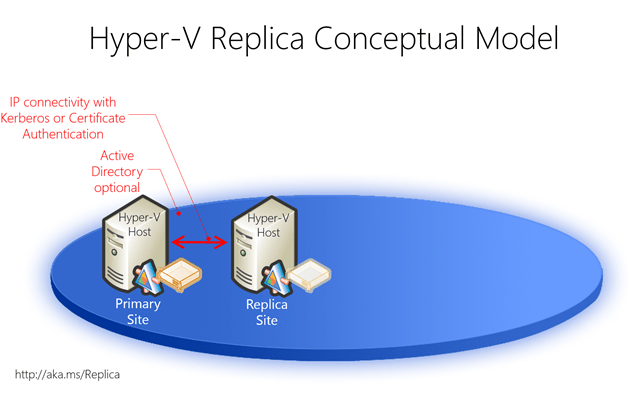 With Hyper-V Replica, administrators can replicate their Hyper-V virtual machines from one Hyper-V host at a primary site to another Hyper-V host at the Replica site. This feature lowers the total cost-of-ownership for an organization by providing a storage-agnostic and workload-agnostic solution that replicates efficiently, periodically, and asynchronously over IP-based networks across different storage subsystems and across sites. This scenario does not rely on shared storage, storage arrays, or other software replication technologies. The following figure demonstrates how Hyper-V Replica lets administrators easily replicate virtual machines to a remote site over a WAN link. Additionally, administrators can use Hyper-V Replica to test the Replica virtual machine without disrupting the ongoing replication. If a failure occurs at the primary site, administrators can quickly restore their business operations by bringing up the replicated virtual machine at the Replica site. Virtual machines can be easily replicated to different locations for greater protection and availability. Hyper-V Replica tracks the write operations on the primary virtual machine and then replicates these changes to the Replica server over a WAN. The network connection between the two servers uses the HTTP protocol and supports Kerberos authentication and certificate-based authentication, with optional support for encryption. Hyper-V Replica is closely integrated with failover clustering in Windows Server 2012, and it provides nearly seamless replication across different migration scenarios in the primary and Replica servers. This allows virtual hard disks to be stored in a different location to enable recovery in case the data center goes down due to natural disaster or other causes.